When buying a bespoke suit, a made to measure suit or a tailored suit for the first time, one of the most frequently occurring areas of puzzlement is making the decision between belt hoops and side adjusters. Whilst the immediate thought tends to be that ‘surely every suit should have belt hoops’ – pause for thought here. Brain washing from off-the-rack casual wear along with styles crossing the Atlantic have led to all but the extreme few suit trousers having belt hoops as standard. Belts really came to prominence in the 1920s when trousers were worn higher – sitting in line with the natural waist, the narrowest part of the body – in an attempt to emphasise a broader shoulder and chest. Although we have seen a recent resurgence in the high waited trouser look, trousers these days are largely fitted to sit comfortably on the hip, meaning the belt has returned to its aesthetic rather than its utilitarian purpose. Having said that, wearing a belt with your suit can be a decorative element too far. A belt, although a must for a jeans or smart casual look, when worn with a bespoke suit serves only to break up the colour, something far better done with a tie and/or pocket square. It also adds an unnecessary focal point, drawing eyes down to the waist rather than up along the tie. 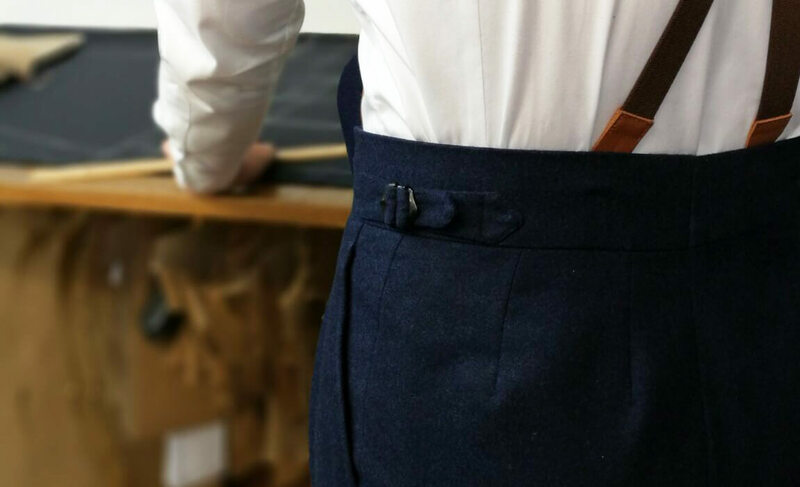 A far better method of giving the trousers a little extra lift is the use of side adjusters, effectively an elasticated tab or buckle that sits either side of the hip at the waistband. Should it be necessary, these can be adjusted to tighten or loosen the fit at the waist, allowing a flatter and cleaner look at the front of the trouser. We also offer the option to add brace buttons to our trousers as they give additional flexibility to the wear of any bespoke suit. Practically speaking, braces are also arguably the most comfortable option for keeping up your trousers as they lift the trouser weight to the shoulders alleviating any pressure or discomfort around the waist, especially when one is seated. 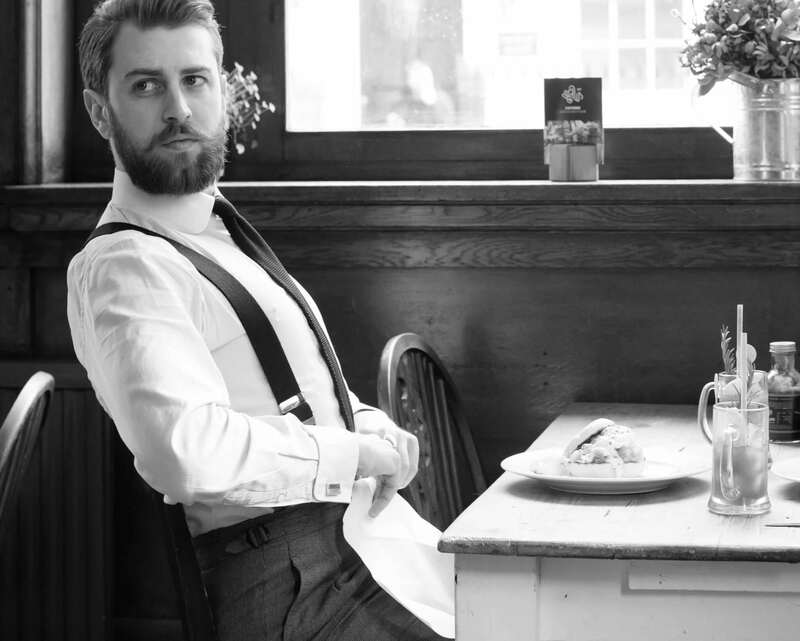 Our range of Albert Thurston braces remain a firm favourite with our customers across the globe with their ability to transform the look and style of a suit, particularly in the warmer months where jackets and waistcoats may be removed. With extensive cloths, colours and styles available, when considered as part of your overall ensemble, the power of braces are not to be underestimated.